Pool lighting systems are connected to a GFCI breaker designed to carry 100 amps for most residential installations. When that maximum load is exceeded, the circuit breaks open, and the breaker trips, which cuts off power to your pool lights. Often the problem can be resolved by resetting the breaker; but if the breaker trips repeatedly or will not reset, the problem may be with the GFCI breaker itself or your pool’s lighting system. GFCI breakers may be one of four designs, and each is reset differently. One style doesn’t flip the switch completely to the off position. The second type of breaker doesn’t look like it’s moved from the on position at all. To reset both of these breakers, flip the switch completely to the off position and then back to the on position. 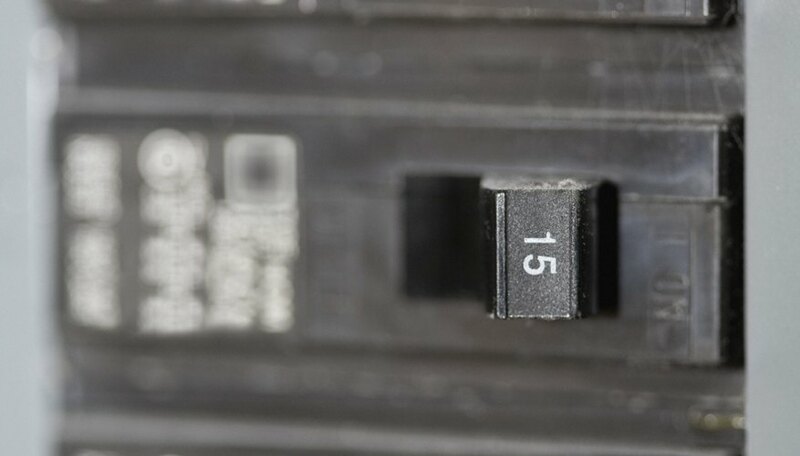 The third design has a window in the breaker that shows a red flag when the breaker is off. Sometimes this type of breaker requires you to wait 30 seconds before resetting it by turning the breaker off and then on. The last type has a red tab on the breaker that pops out when the breaker trips. Push this tab back in to reset it. A temporary electrical surge or humid conditions can cause an electrical circuit overload. An overloaded circuit often occurs when the lights are demanding more power than the circuit can provide. Overloaded circuits are typically caused by a faulty electrical cord, an accidental ground or there may be too many appliances connected to a single circuit. Add up the amperage required to run your pool lights. If this exceeds the rating of your GFCI breaker, then connect some of the lighting to a second GFCI breaker or call an electrician to replace the existing breaker with one that can handle the load. A blown bulb will often cause the breaker to trip when you turn your pool lights on and then off again. After replacing the bulb, you should be able to reset the breaker and turn the lights on and off without a problem. Other causes of occasional tripping include water on the electrical components or a loose breaker. If the breaker panel is wet, do not turn the breaker back on. The electrical panel must dry out first to avoid injury. However, if there is no water on the GFCI breaker, check that the switch itself is not loose. Push it back into the panel and try to reset it again. If it won’t sit firmly without wiggling within the panel, the breaker should be replaced. If the breaker connected to your pool lights trips every time you turn the lights off and on, there may be a faulty wire within the lighting system. To determine which electrical component is causing the problem, make sure the breaker is off and then disconnect each light in the system one at a time. Tape off bare wires, as you disconnect them, to prevent injury. Turn the breaker to the on position after each disconnection. If the wiring of the lights is faulty, the breaker will stay on when you’ve removed the malfunctioning wire. If this does not resolve the problem, the breaker itself may be malfunctioning and will need to be replaced.